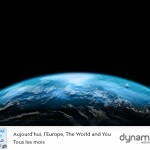 Aujourd’hui, l’Europe, The World and You is a bilingual radio talk show in english and french. The news scale is global and the content tackles issues which aren’t debated in traditonal medias. Arnaud and his friend, Charlotte, are both bilingual and assist us with their knowledge and their good mood. Hi Five brings aslo a international student for each show to contribute to the debate.